I seem to be into stacking my food lately. Setting down a plate with layers of yummy food evokes inevitable wows from guests, looks both pretty and delicious, and well, allows me a brief sashay into my pretend world as the chef-like Mlle. Julia. Heureux de vous recontrer, mes amis! 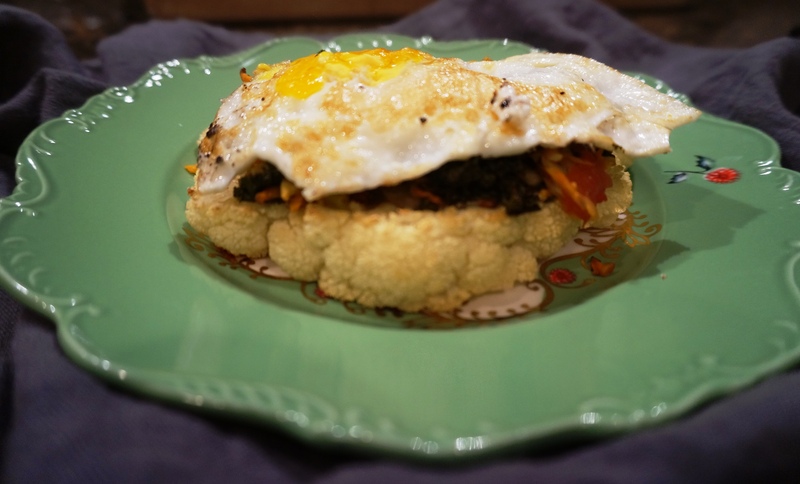 And one way to liven up a meal is by topping a delicious mound of vegetables with an egg. 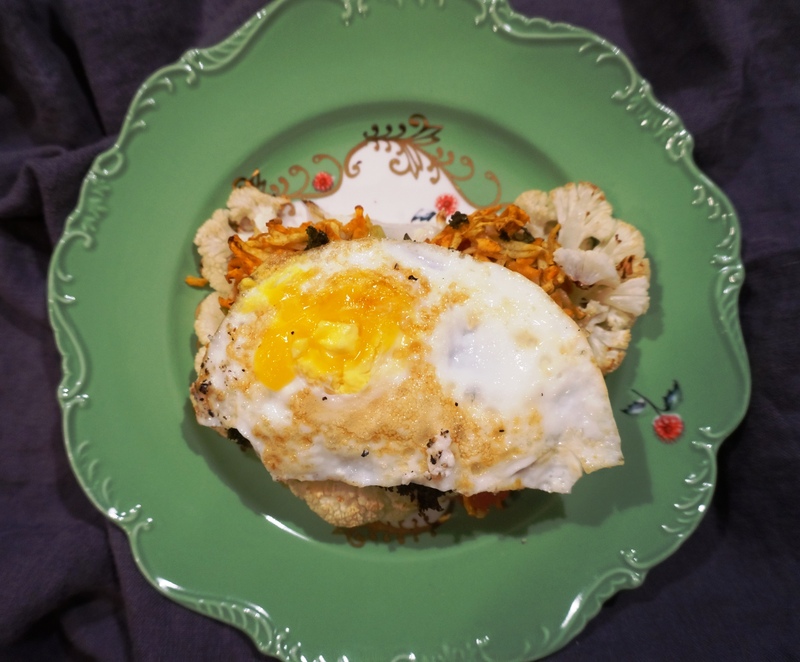 Last evening, I enjoyed another storied delight, courtesy of a base of roasted cauliflower steak, Kimberly Snyder’s Southwestern Savory Root Vegetable Latkes, and yes, an egg. Fried, this time. Nutritional sidebar: By the way, eat your eggs whole (unless otherwise directed by your doctor). I am a huge advocate of keeping our foods intact – in their original package, so to speak. As a complete entity, the egg will provide you with an excellent lean source of protein, inflammation-blasting omega-3’s, vitamin D, and plenty of B-vitamins. The amino acid, leucine, helps the body produce growth hormones and is also a terrific blood sugar stabilizer. Without the yolk, you miss out on most of these amazing nutrients. Preheat oven to 350 degrees and grease baking sheet with coconut oil. In large bowl, mix together grated sweet potato and yam (I used my food processor for quick grating but you can use your old faithful – the hand-held grater), spices and salt. Add scallions, spinach, and tomatoes and mix well. Moisten hands with coconut oil and form patties. Place on oiled baking sheet. Bake for 40 minutes or until tops are slightly browned. So, I placed these little mounds onto my baking sheet. I then sliced a couple of thick wedges of cauliflower ‘steaks’ and added these to the sheet. 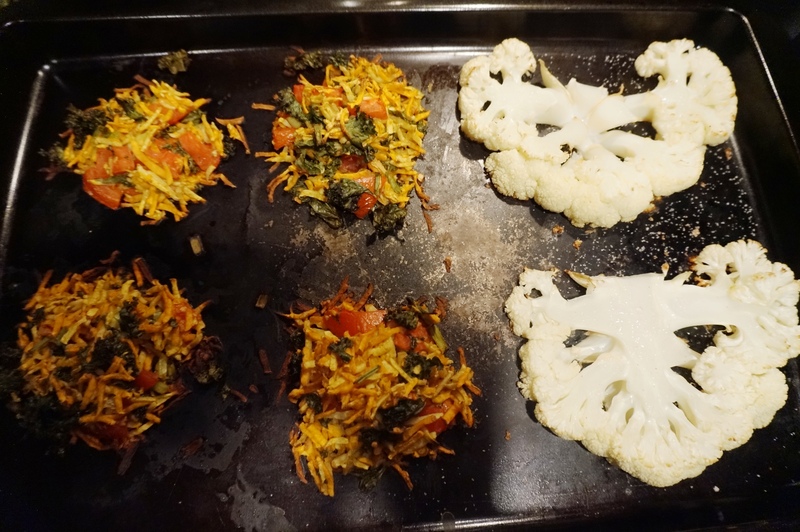 These went into the oven for the allotted 40 minutes…which actually ended up being about 45 – 50 minutes. 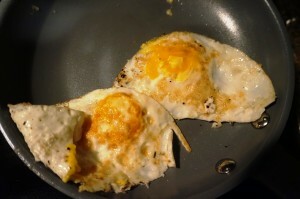 Towards the end of the baking time, I fried up 2 eggs in a tad of coconut oil. I removed the baked goods from the oven, and started stacking. This website is intended to provide nutritional information for educational and entertainment purposes only. The content is not intended to be a substitute for a professional diagnosis or treatment. If you have specific health concerns, you are encouraged to consult a qualified health care practitioner.